WE-GO's History: The Westtown Goshen Rotary Club, widely known as We-Go, was formed in the summer of 1975 through the efforts of members of the Rotary Club of West Chester. This was a culmination of discussions started in the summer of 1974 which resulted in We-Go being chartered by Rotary International on June 20, 1975. 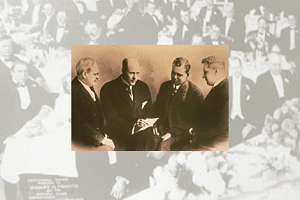 Nine members of the West Chester Club, along with one member from the Concord Club, made the nucleus of the new club. They, along with 16 newly recruited first-time Rotarians, made up the original 26 charter members. Much help was given by the West Chester members in the initial formation. 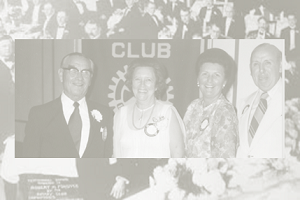 On July 31, 1975, the Club's Charter Night Dinner-Dance was held at the Treadway Inn, and was attended by all the new club members and their wives. District Governor Paul A. Vaughn and District Governor elect F. Munro Purse, and many members of other clubs were present. Weekly meetings were established on Thursdays at 6pm. The venue initiated at the West Chester Treadway Inn and later transitioned to the West Chester County Club and then back to the Day's Hotel where meetings are still help weekly. WE-GO is the Greater West Chester area's evening club devoted to community, fellowship service.